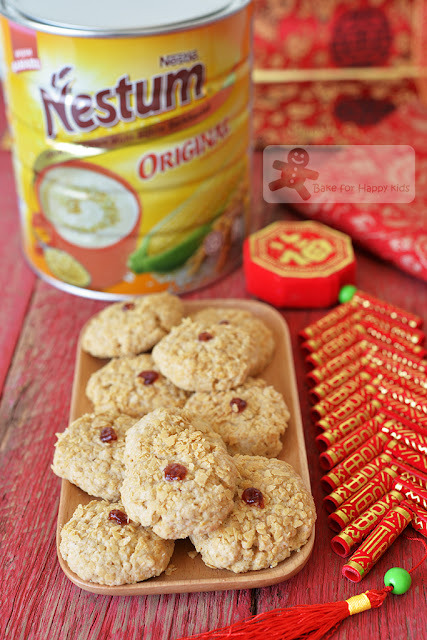 For those who don't know or curious to know something about Nestum, you might wish to read my previous Nestum cereal cookies at here and here. Although Nestum is commonly available in Singapore and Malaysia, it is not easily available in most non-Asian countries such as US, Europe and Australia. Can't find Nestum? Thanks goodness now that there is internet in this world and you can buy Nestum via online and Amazon. If you are living in Melbourne, you can buy Nestum at some Asian grocery shops at Boxhill. Have you been to Singapore or Malaysia and tried Nestum butter cereal prawns or anything with Nestum and butter? The synergistic relationship of Nestum and butter is something like peas and carrots, strawberry and cream, peanut butter and jelly or salt and pepper!!! These ingredients are really good and delicious on their own but even better when they are cooked, baked or served with their complementary partner. Thus, you can imagine... these extra buttery Nestum cookies must be extra extra extra delicious!!! So obviously delicious that my family and I have unanimously agree that these cookies are even more delicious that the crispy Nestum cookies at here but fight-able with the extra crispy Maximally-Loaded Nestum cookies at here. And I will explain more later. Interestingly, I didn't add more butter to make my EXTRA BUTTERY Nestum cookies!!! I just omitted the addition of egg and added slightly lesser flour to bake these cookies and it works so perfectly well!!! I actually did a blind taste test with all three different crispy Nestum cookies that I had baked. While the cookies were cooling on the wire racks, I told my two guinea pigs (my husband and son) to eat whatever cookies that they like and counted the leftover before transferring the cookies into a cookie jar. The test result is distinctively obvious! Based on my count, I can see that my husband and son had been attacking THESE extra buttery cookies and also the extra crispy Nestum-loaded cookies at here but ate just one crispy Nestum cookie each at here. Please don't get me wrong. I must say that ALL three of Nestum cookies are yummy but THESE extra buttery ones and the extra crispy Nestum-loaded ones are noticeably BETTER! "Wow! These cookies are very fragrant!" "Eat this one. This one is better!" "YUM!!! I love this buttery and Nestum taste!" "There is a lot of Nestum in these cookies! Very nice!" "Mum, can you save some of these specially for me before Daddy eat them all?" Hmmm... Well, what say you? I have say... The crispy Nestum cookies are not lousy!!! They are just not as impressive as the extra buttery and the extra crispy Nestum cookies. That's it! Told you that this Buttery Nestum Cookies is another GOOD recipe!!! It is another MUST-TRY recipe if you are a Nestum cereal fan like us. These slightly paler Nestum cookies were baked with no egg and MORE OBVIOUS buttery taste. ... but we can clearly taste the differences!!! It's easy too!!! Watch this video to see how I baked these cookies. 3) It's a must to coat the cookies with oil and extra Nestum. This step will make the cookies extra crisp and fragrant! If you are after Crispy Nestum Cookies that are firmer with a subtle crunch, please use the recipe at HERE. These cookies are easiest to handle, stack and give or sell. If you are after EXTRA Crispy Maximally-Loaded Nestum Cereal Cookies, please use the recipe at HERE. These cookies are super crisp with not-too-compact-and-not-too loose piling layers of Nestum cereals! 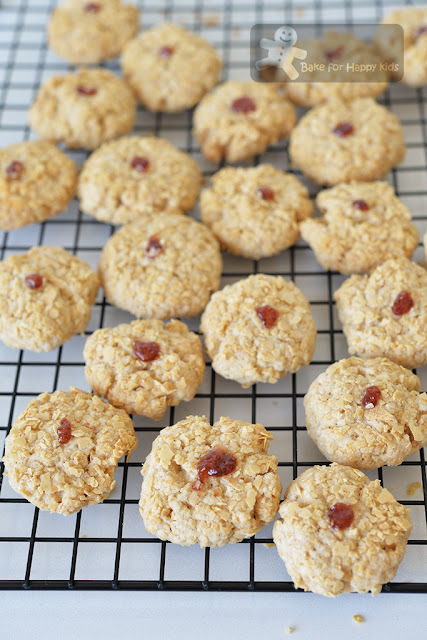 If you are after Buttery Crispy Nestum Cookies, please use THIS recipe. The obvious buttery taste of these cookies are making these Nestum cookies tasting even better! Extra Crispy Nestum loaded Cookies at here - extra crispy with twice amount of Nestum! 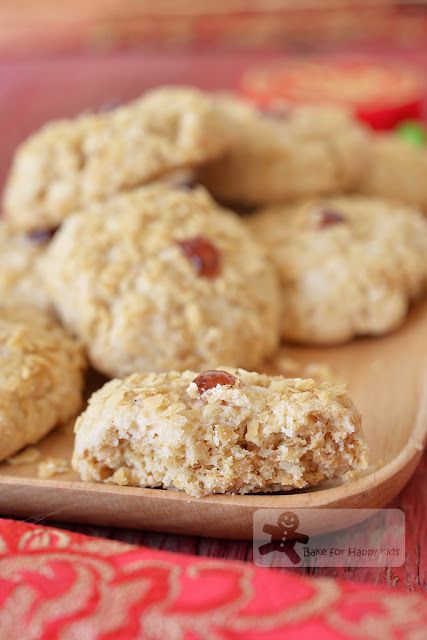 Here's my MUST-TRY Buttery Crispy Nestum Cereal Cookies recipe. * Some recipes uses red glace cherries to decorate the cookies but I prefer mine to be decorated with tiny dot of strawberry jam. This is because I like my cookies to be completely crispy with no interfering chewy pieces of glace cherries. Line baking trays with baking papers. Spread 50g Nestum cereal on one prepared baking tray. Bake for 7-8 mins or until lightly toasted and fragrant. Set aside to allow cereal to cool completely. Using a wooden spoon or an electric mixer with paddle attachment, beat butter, sugar and vanilla until combined and fluffy. Sift flour, cornflour, baking powder, baking soda and salt into the butter mixture. Add toasted Nestum cereal and use a spoon or spatula to mix until combined. Transfer mixture onto a plastic wrap and use the wrap to knead slightly until mixture forms a dough. IMPORTANT: Do not over-knead the dough even if it is semi-loose and crumbly. Divide and gently squeeze tablespoonful of dough into balls. Brush oil on one side of the cookies and coat the brushed side with extra Nestum cereal. Arrange cookies dough onto the lined trays about 2-3 cm apart with their coated sides up. 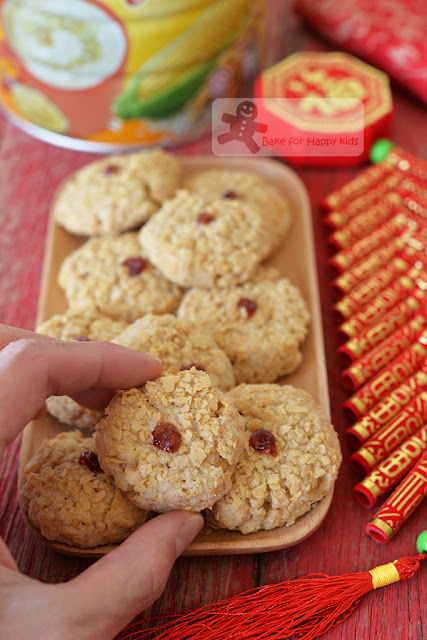 Use your finger to flatten the cookies slightly and pipe a small dot of jam on each cookie to decorate. You got me sold! I am trying this out by this weekend. Thank you for sharing. Nestum cookies!? I havent laid eyes on a can of nestum for ages. Remember the dredded stuff my mom shoves down my throat LOL . this looks nothing like it .